Davidof Cabin is a typical Alaska A frame. Two bunks down stairs and a sleeping loft. For the float plane traveler who is planning to leave his plane on the beach there are two issues a rocky beach and high winds heading toward the cabin. No problems dropping someone off, but not a place I would leave my plane overnight. The hills on each side of lake are high and steep, I did not see any safe alternate tie up. 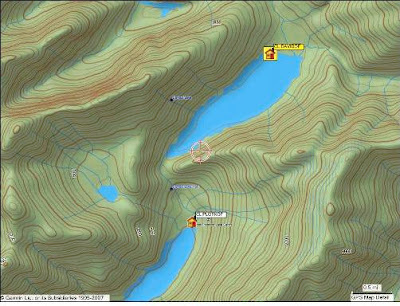 The cabin is not visable from the lake, look for a small sign on a tree where my waypoint is, not where the Forest Service way point is located. 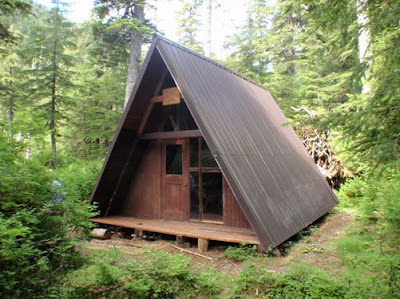 The Forest Service put a new roof on the cabin a few years ago but did not put a roof on the outhouse, guess it should be called an outseat. How about a roof Forest Service, it does rain around here.